But where is the car? Popped out tonight after work to catch the sunset but in the end it just faded to nothing. So I took a walk down the Chesterfield Canal instead. Then, as it started to get dark, I took some time to play with long exposures. The one above is a couple of seconds. 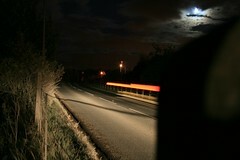 The most interesting thing I think is that there is no sign of the car; quite a spoky effect. Really starting to enjoy my new camera.